A luxury villa with 5 bedrooms, heated swimming pool, gym, jacuzzi and sauna. Wheelchair friendly property. Walking distance to beach, bars and restaurants. This spacious and modern villa is full of luxury touches. A stunning illuminated glass spiral stair case to welcome you as you walk through the front door. The ground floor has a large open plan living/dining/kitchen with bi folding patio doors that lead from the lounge out onto a large south facing sun terrace overlooking the swimming pool. The living room has a 42" plasma TV. DVD player, satellite TV, an iPod docking music system. and wi fi internet. The fully fitted modern kitchen comes fully equipped with everything you might need during your stay. There are two double bedrooms on the ground floor, each with en suite, one caters for wheelchair users. On the first floor there are a further three double bedrooms, the master with a luxury en suite bathroom and a family bathroom. The lower floor has a six person jacuzzi, a sauna, a steam shower and a full gym. There is a separate laundry room. There is ample outside seating for al fresco dining and sun loungers round the pool. The glorious south facing terraces are sunny all day, with plenty of seating and shade if needed also. The villa is located in Torrenueva, walking distance to the nearby clean and sandy beach, where there is an assortment of beach bars to choose from. Within a short walk there is a small supermarket and various bars and restaurants, India Lucia in particular comes highly recommended. The beautiful village of La Cala de Mijas is a 15 min walk from the villa, where you will find a twice weekly market on Wednesdays and Saturdays. The village has a wide variety of restaurants to suit all tastes, from typical Spanish fresh fish and paella on the beach to international cuisine at the Mijas Playa, with a selection of Thai and Chinese in between, something to suit all tastes. 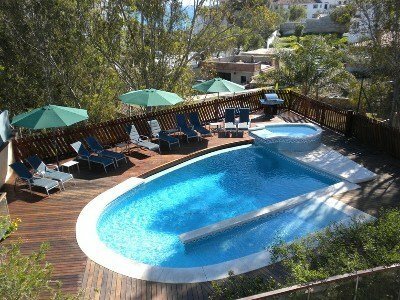 The villa is centrally located, in between Fuengirola and Marbella and only 30 mins from the airport. There are many golf courses within a short drive, some of the most popular being Santana Golf, the ever popular La Cala Golf Resort, Santa Clara Golf Club and Santa Maria Golf Club. For those that seek a bit of adventure there lots of activities to choose from, you can swing from the trees at Adventura Amazonia in Elviria, or the Buggy Safari Marbella do guided tours through the countryside in both buggies and quad bikes. For the kids there is the Parque Acuatico Mijas, Tivoli World and the fantastic Bioparc zoo in Fuengirola with their new white tigers.